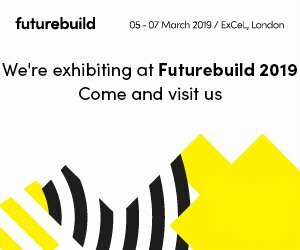 This year Project SCENe and EV-elocity had the opportunity to share a stand at Futurebuild, which is an event exhibiting the latest innovations, products and materials in the building sector. 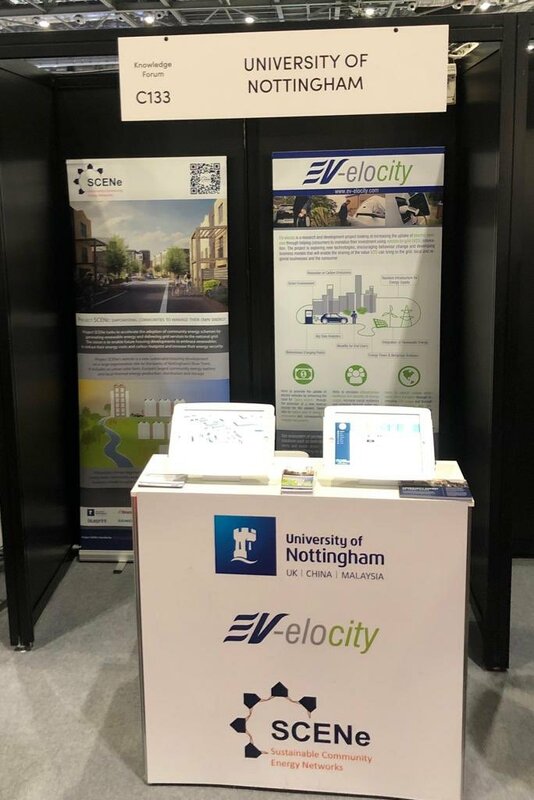 The visitors of our stand had the opportunity to learn more about generation of renewable energy using photovoltaic panels, storing energy using a community battery (… the largest community battery in Europe! ), storing energy using electric vehicles, smart charging and vehicle-to-grid technologies and the strategies developed to optimise the energy distribution to the grid. As part of the event, we conducted a seminar about the process of shaping a community energy for a more sustainable built environment. 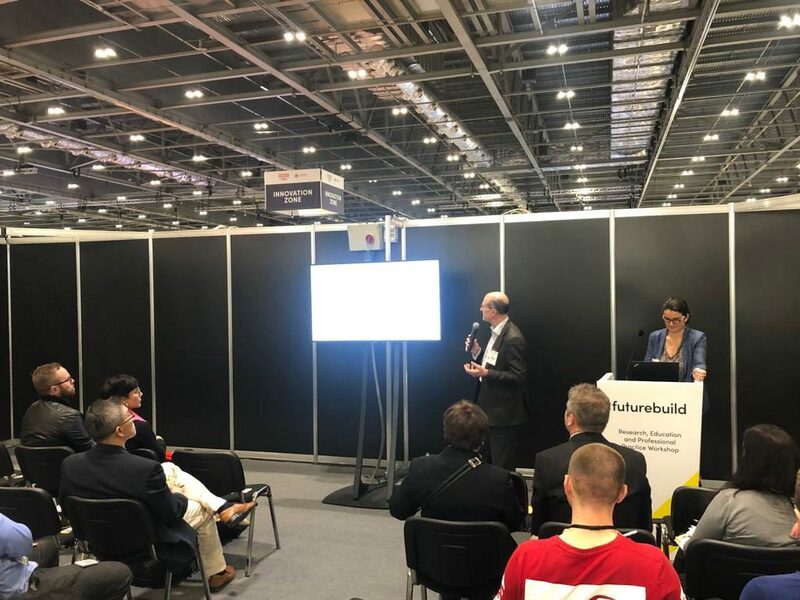 Charles Bradshaw-Smith from SmartKlub, Prof Mark Gillott and Dr Julie Waldron from the University of Nottingham conducted an interactive session to gather the audience’s perception regarding renewable energy at community level. Attendees were asked to vote on 16 multiple-choice questions using an electronic voting system imagining they were the homebuyers of a project including a community energy scheme. 1) An Energy Service Company (ESCO) acting as a legal entity under which the assets and financial responsibilities lie. 2) An ESCO Management Company as the responsible for operating the community energy system. 3) The Residents (the participants of the workshop) lending their roofs/land space to accommodate the renewables (e.g. PV/Heat Pumps). 4) The Foundation Financer acting as an investor of the initial money to fund the energy system. 5) The Developer that installed the renewables. The ESCO would earn revenue from providing ancillary services to the grid and from fair price energy sales to the Residents. The system proposed has costs of maintaining the energy assets, operating the energy centre, undertaking customer service and paying the finance. The project aims to make a surplus to share with the residents so that they have reduced energy costs for their local renewables. ESCO Surplus: 55% of the participants think it is ‘fair’ to vary the surplus share year to year based on the ESCO profits and their behaviour. 36% suggested that it is ‘fair but…’ commented on aspects such as “what if some households ‘waste’ energy, how do you ensure the energy use is ‘fair’ between households, who decides what is fair?” and “… should reward sustainability”. 9% think it is ‘unfair’ the variation of the surplus based on the ESCO profits and their own energy behaviour. 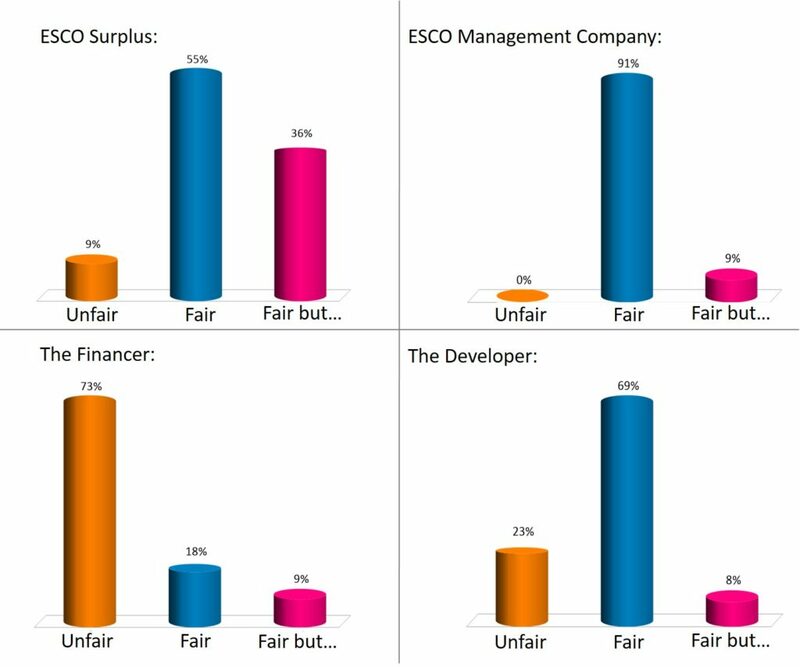 ESCO Management Company: 91% think it is ‘fair’ for the ESCO management company to recover their costs from the ESCO and only earn profit if it achieves the surplus target. 9% think it is ‘fair but…’ some aspects should be discussed further. The Financer: 73% of the voters found it is ‘unfair’ the fact that the financer is a sleeping partner who gets a fixed annual return regardless of ESCO performance. 18% think it is ‘fair’ and 9% think it is ‘fair but…’ “…there is no point on starting if finance can’t be guaranteed”. Residents Investment on the ESCO: Once the residents see the viability of the ESCO they should be allowed to invest to receive the same return as the Foundation Investor. 69% of the participants responded ‘No way that’s eating the investor’s lunch!’, 15% voted for ‘Of course’ and 15% think ‘ok but…’ there are facts to be discussed. 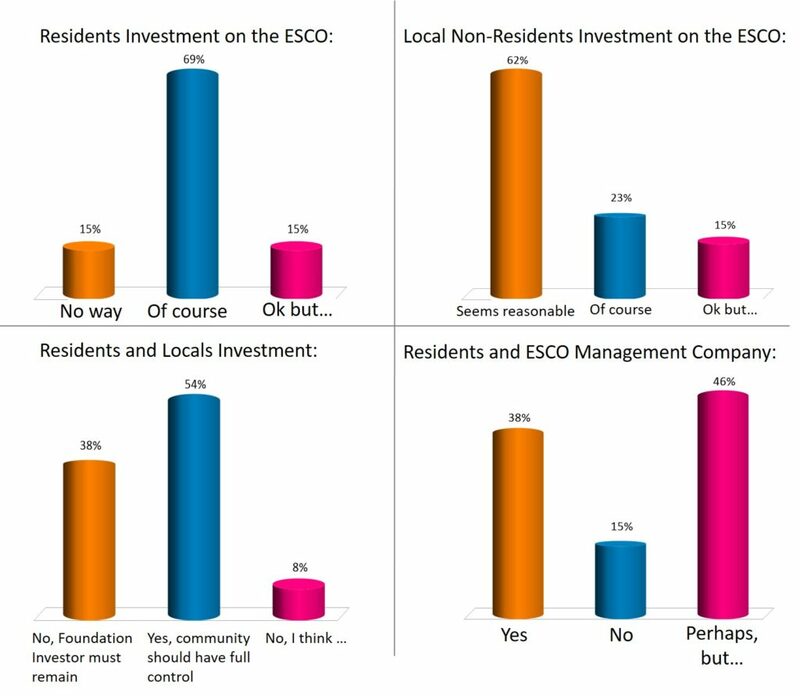 Local Non-Residents Investment on the ESCO: 62% think it ‘seems reasonable’ to allow local non-residents to make a green investment in their neighbourhood and buy-in to the ESCO. 23% responded ‘of course’ and 15% think it is ‘ok but…’ “not exceeding the residents’ share” and “protect the initial investor”. Residents and Locals Investment: Residents and Locals can only acquire 49% of the ESCO. To get full control they have to buy-out the Foundation investor 100%. 54% of the participants think ‘yes, the community should have ability of full control’. 38% think ‘no, the Foundation investor must remain’. 8% voted for ‘No, I think…’ there are facts to be discussed. Residents and ESCO Management Company: 46% think ‘Perhaps’ the residents should have ultimate say of who the professional ESCO Management is, they commented on aspects such as… “can there be an advisory board?”. 38% think ‘yes, because this company affects their surplus share’. 15% think ‘no because they are not qualified to judge’, and commented… “should be able to change between management”. Community Representative: 85% think that a community representative should attend ESCO board meetings as a ‘Full board member’. 8% considered that the community representative should attend as an ‘Observer’, 8% considered it is ‘better to…’ “have a group of representatives rather than an individual = diversity and a wider range of options”. No votes for the option ‘No, let the professionals do it’. 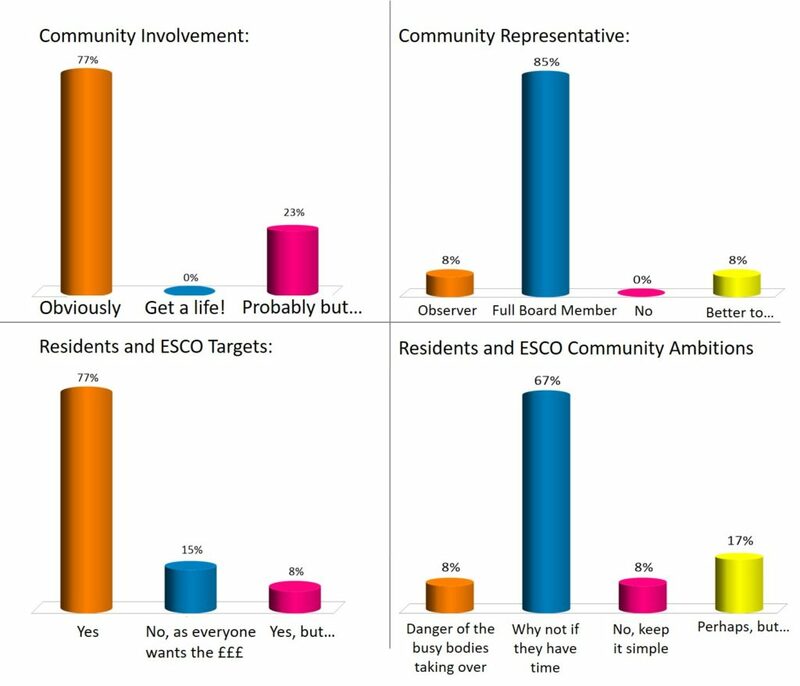 Residents and ESCO Targets: 77% of the participants think the residents should have a say in the ESCO’s targets (e.g. environmental, economic or localism). 15% voted for ‘No, as everyone wants the money’. 8% think ‘yes but…’ “moderated by only one vote on the board”, and “at the development stage”. Residents and ESCO Community Ambitions: Residents should steer the ESCO’s community ambitions (e.g. new services like electric vehicles and demand side response). 67% of the participants voted ‘Why not if they have time’. 17% think ‘perhaps but’ … “there is something to be said for simplicity – where do you draw the line, keeping it fair for people who don’t have time to be more fully involved?” and “let the residents be involved to benefit the community and show that the company is listening. A present representative at relevant meetings”, and “some options require infrastructure at founding level”. 8% of the participants voted ‘Danger of the busy bodies taking over’ and 8% think ‘No, keep it simple’. No Call Centre or Office: 50% of the people agreed with the fact of not having a call centre or operated office to reduce costs and increase surplus share. 17% of the participants disagreed with this proposal and 33% agreed but commented on some aspect such as: “they might need a response to a query that can’t be explained in an App”, “what if there is a problem need escalation?”, “if they ask a specific question, not multiple choice” and “they have to have somewhere to go if there is a complex issue”. Service App: The service App records all interactions with an audit trail and a 24-hour response service level. 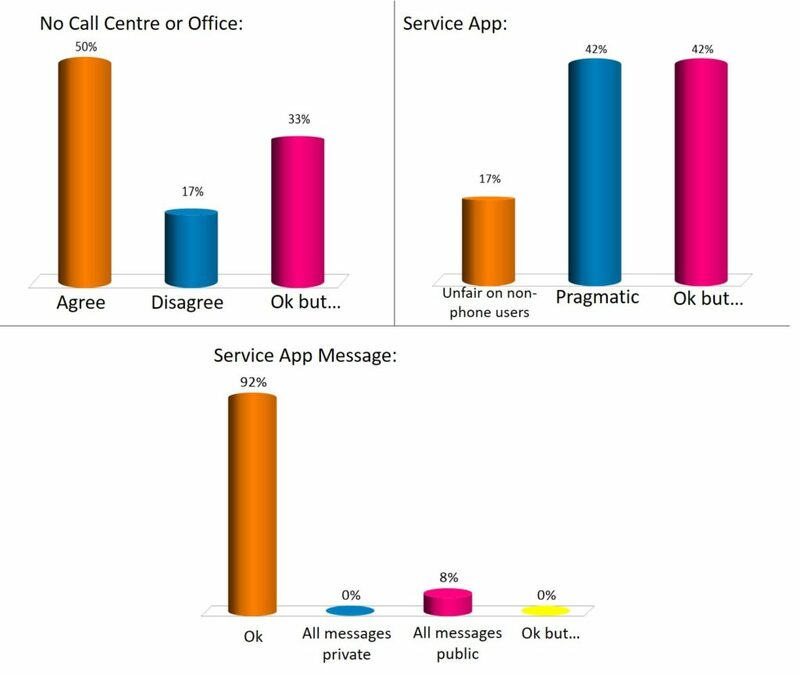 42% of the people think this is ‘Unfair on non-phone users’, 42% think it is ‘Pragmatic’ and 17% think it is ‘Ok but…’ “Depend on demographic (e.g. elderly and vulnerable), “if aware of non—phone users ensure that they are visited regularly to ensure they are ok with everything or have opinions”, “ok, but what is the option for non-phone users?” and “alternative options should be provided”. The questions presented in this workshop highlighted the many complexities about running a Community ESCO from renewables. So, the participants where asked: Is it worth all the hassle?? 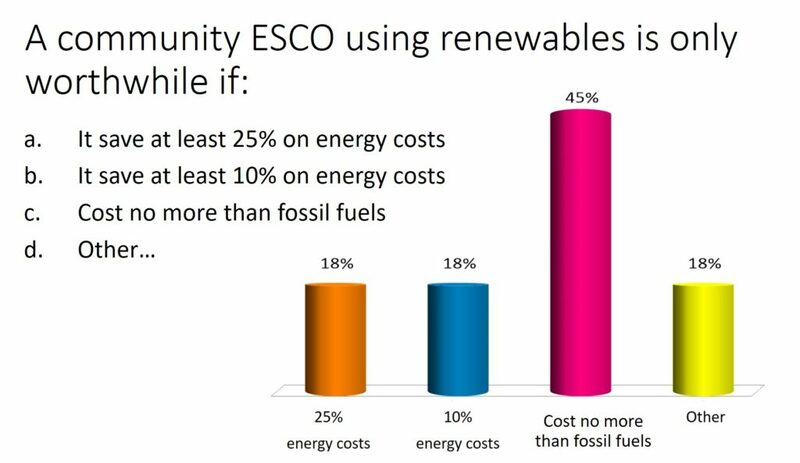 According to the previous chart, 45% of the participants think a community ESCO is only worthwhile if it saves ‘0% but no more than fossil fuels’. The opinion is evenly divided into the other options ‘25% energy cost’, ‘10% energy cost’ and 18% voted for the option ‘Other…’ and commented: “not just costs, CO2 and environment” and “this is really dependent on your community process + messaging + needs to really connect + empower people within isn’t always easy”. As a summary, it is was interesting to see how the audience agreed in aspects such as: the variation of the surplus according to the ESCO profits and energy behaviour, the ESCO recovering the investment and earning profits based on achievements, allowing other local non-residents to be part of the community project, expecting to have the community fully involved as part of the board and having a say in the ESCO’s community ambitions, and finding community energy schemes meaningful if at least they are not more expensive than fossil fuels.